Keep The Magic Of Santa Alive With PackageFromSanta.com & A PERSONALIZED Phone Call! HomeKeep The Magic Of Santa Alive With PackageFromSanta.com & A PERSONALIZED Phone Call! Last year, I discovered PackageFromSanta.com! This is AMAZING I tell you! Lydia was out of the spirit and a little "down". This made her SO HAPPY and excited! Here is a picture from last years box! 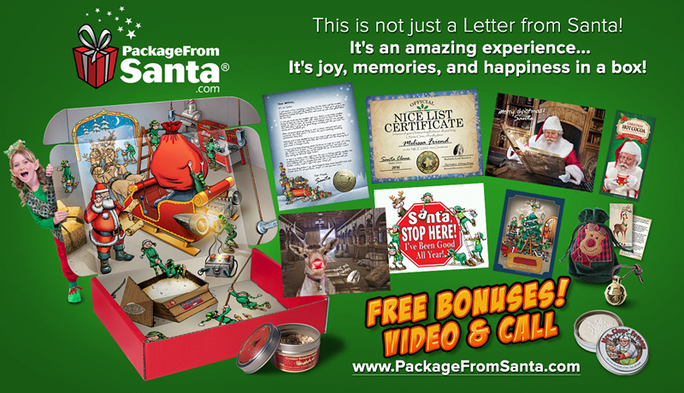 What makes PackageFromSanta.com so special and set apart from any other company is THEY DO IT ALL (packages, letters, calls and videos from Santa and so much more...) With EVERY Package From Santa sold comes one free call and one free video. This year, I wanted to also show you Santa calling Lydia himself!See the video below for yourself! PackageFromSanta offers three unique treasure chests to keep the magic of Santa alive for your child. The goodies are sent from the North Pole, addressed to your child from SANTA!! The package has a real return address from Santa and a stamp from the North Pole. Each package offers a phone call from Santa and a video call starring your child. ($15 value for FREE). While each package varies, we received the Platinum and this package was pretty neat! It comes with so many goodies! This really got my daughter so excited! When your order, you choose your package and letter. You get the chance to pick a template that they offer and you can personalize it or make your own! It is so neat! Check out our unboxing below to see what is inside for yourself! Start a new Family Christmas tradition with the #1 online Santa Letter service today with the only company that DOES IT ALL: Use the code RED1810 to save 25% on all packages on PackageFromSanta.com now! **BEWARE! ** Of online Santa Letter copycats! Only PackageFromSanta.com has an A+ Rating with the Better Business Bureau and top-notch customer service for over 10 years. And don’t forget Santa’s Super-Satisfaction Guarantee: YOUR child (and you!) must be absolutely delighted—100% thrilled in every way—or we’ll send you a prompt and cheerful refund, no questions asked. Questions? My Christmas Cheer Team is happy to help! 866-894- 4789. Visit their social media below to stay up to date with the latest! What a great idea !! Ti love the fact that it uses a photo of the child.thank you , i bookmarked it. This would be a neat package for gets! Very cute! I've been trying to remember when I knew 'the truth' about Santa, lol. I honestly don't remember finding out. Ha! I love the Rudolph photo. My youngest nephew would flip over this. This is pretty cool. Love this idea. This would be great for my grandsons. I especially like the little tins. Kids could keep those when what's in them is long gone. Very cute. This would be fun to do for the kids. The idea of including a call from Santa is a great notion, too. Kids would really get a thrill out of that. I like that it comes with phone call from Santa and a video call starring your child. My youngest nephew would really love this kind of thing. Santa is huge with him, lol. such a fun idea, its great they let you personalize it. I could see my youngest nephew really being thrilled by this. This is a nice idea! This is such a cool idea. I like that it comes address from Santa and has a stamp from the North Pole. Having Santa's return address is good! I used to send my niece & nephews cards from Santa--until they noticed they were postmarked in the town I lived in, lol. Like it, this would be great for my Niece. I really love this idea. what child wouldn't love a gift and phone call from Santa. Hmm, I might need this for myself. I need reassurance that I'm on the nice list, lol. This is a great way to surprise your kids. kids would love a personalized gift from Santa. I think any kid would be thrilled to get this. It's really a nice idea. What a cute idea! My kids would go crazy over this! What a fun holiday idea. I like that there are different packages to choose from. This is something all little kids would enjoy. Some of these items would be keepsakes forever. This is a great package. My grand children would love getting this! What a fun thing for kids to receive. I like that there is a 60-day money back guarantee and they have an A+ rating with the BBB! This is great! My kids would love this. What a good idea to keep Santa alive. Oh, my goodness, how excited would young kids be to get this & a phone call from Santa!! Very! This is such a cool idea, any child would really enjoy this. I love those little tins (one has a cookie in it.) Those would be great little keepsakes. This is so cute & a great idea! My girls would have loved this when they were little. This would so much fun for my grandsons to receive. Such a cute idea~My grandchildren would love it! I think I would've loved this as a kid. I can imagine the thrill of any kid getting this. What a special surprise this would be for your kids to receive, love it! This would be such a sweet thing for a young kid. The North Pole postal stamp is a nice touch, lol. This would be great for young kids, especially. It would help preserve the belief for a while, lol.